Amid anticipated growth in baby boomer patient volumes, ongoing adjustment to greater acuity in ICD-10 coding, and a focus on ambulatory coding under MACRA (the Medicare Access and CHIP Reauthorization Act), the rush to secure top-notch coders is on—again. In late 2015, the industry experienced a similar spike as coder demand increased leading up to the implementation of ICD-10. During that time, expanded outsourcing alongside mass hiring of both onsite and remote coders became the norm. While the coding industry did see a slight dip in productivity post-ICD-10 go-live, coders have acclimated and workforce output has climbed back up regardless of location (onsite or remote). 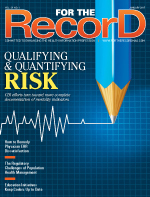 But are new market forces once again pushing the need for more qualified medical record coders? Will the pendulum swing back to an acute coder shortage? And if so, will a virtual coding workforce provide the solution? • Coder access. Unlike in-house hires, remote work arrangements open health care organizations to broader coding talent pools that are not constrained by geography. • Coder quality. Virtual coders often have diverse coding experience across various health care settings, workflow processes, and technology platforms. Additionally, they bring new perspectives to HIM directors. • Cost containment. In many situations, outsourced virtual coding reduces operational costs. Outsourcing eliminates internal hiring burdens and the related investments required for coder training, credentialing, and software programs. • Coding safety net. Providers can secure arrangements with outsourced virtual coding resources in advance of an anticipated peak season or a special project, ensuring there are no steep production declines when case volumes spike. Closely watch core performance metrics to keep a handle on remote coder productivity in real time. For example, monitor coder sign-ins and sign-outs on a daily basis. Striking a balance between keeping communication flowing without having coders feel micromanaged is key. Reconcile coder productivity reports with any outsourcing partner reports. Virtual, outsourced coding teams should also perform quality audits on their own staff and align their policies, procedures, and benchmarks with the client's internal requirements. • Monitor the amount of time for each encounter against case acuity and length of stay. • Be mindful of the time remote staff spend on required e-mails, phone calls, query writing, and research. Factor these considerations into the productivity tracking of remote coders, whether it be the organization's own or outsourced ones. • Share productivity reports with remote coders to highlight improvement objectives. Lending insight into these performance elements offers transparency for all stakeholders. • Recognize all remote coders (internal and external) when they receive praise from your facility or achieve outstanding audit results from their employers. Make them a part of your internal team. • Conduct virtual meetings at least once a month to include everyone. Frequent e-mails can be an effective tool. • Hold education sessions and virtual coding roundtables to discuss different case aspects for both internal and outsourced coders so everyone has access to the same information. • For large teams, align coders by areas of specialty. Get to know coder strengths and weaknesses, and assign workloads accordingly. Virtual workers often feel invisible; it helps immensely when staff are connected. Team engagement can be a huge motivator for outsourced coding teams; this in turn strengthens the working relationship between facilities and their vendor partners. A strong emphasis on team dynamics is the glue that binds in outsourced virtual coder arrangements. Hospital-based and outsourced coders alike thrive under a teamwork approach. While many facilities think of contract coding companies as only staff resources, outsourced coders are more effective when they become an active part of a coding team. Coders who have established relationships with hospital-side representatives are more familiar with the intricate needs of the facility and more invested in organizational success. Outsourced coders are there to assist, not take over. Finally, facilities must be sure their outsourced coding partner has dedicated resource managers, coding compliance managers, and IT technicians on hand to service the account. As with so many other areas of health care, communication, transparency, and accountability are the cornerstones to sustained success in an outsourced remote coding environment. Above all, facilitating connection among coders and the rest of the health care team across the geographic spread requires a concerted communication effort. Establishing remote connections for access to the EHR, encoder, e-mail, and more can take a day or a week depending on the facility's IT capabilities and HIM support. Be considerate of time constraints, tech and internet needs, and communication preferences as you create a formula for staying connected with remote coding staff in an ICD-10 environment. — Christi Roberts, RHIA, CCA, has more than 15 years of experience in HIM. As director of operations at Woodham HIM Solutions, she's an expert in the areas of EHR implementation, master patient index, operational assessment, revenue cycle management, and coding and auditing.